People dining under the night lights that adorn Place Jacques-Cartier in Old Montreal, Quebec on a warm summer evening. Place Jacques-Cartier in Old Montreal in Montreal, Quebec has some exceptional restaurants with outside terraces which makes dining during the summer months beautiful. A trip to Place Jacques-Cartier is never complete until you spend an evening dining in the night time air amongst the glow that illuminates the street. Restaurants along Place Jacques-Cartier at night in Old Montreal, Montreal city, Quebec, Canada. 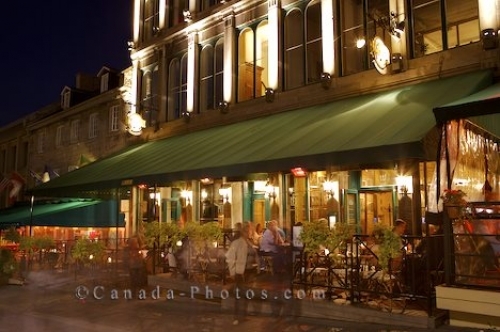 Picture of a dining establishment in Place Jacques-Cartier in Old Montreal, Quebec during the evening.